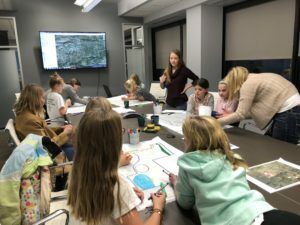 Baseline recently hosted Girl Scout Troop 1503 in support of receiving their STEM (Science, Technology, Engineering, and Math) badges. 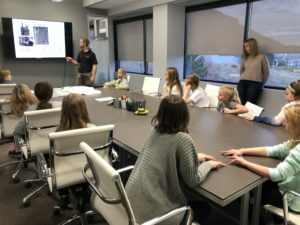 Baseline’s Civil Engineering Division Manager Noah Nemmers and Planner Melanie Nieske delivered a presentation to the troop about the planning, surveying and civil engineering professions and discussed the types of problems Baseline encounters and solves on a daily or project basis. The girls were then broken out into groups and were tasked with planning a tiny home community. 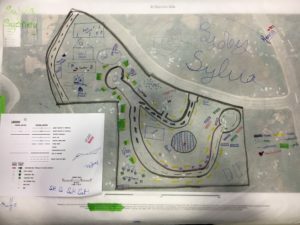 They were provided local land plots to layout their communities that also incorporated essentials such as parking, open space, utilities, and stormwater runoff. They were very creative with their communities. Various features they included in their developments consisted of ponds, community centers, golf courses, parks, tree houses, gardens, stables, clinics, and even a snack shack!